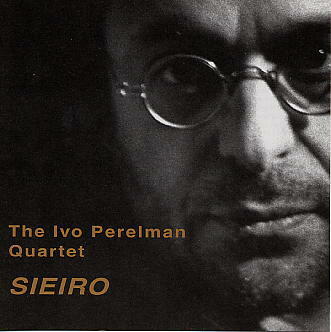 The names on this disc will be known to many readers of Musings, and they’ve all played with one another from time to time in the past, although in such an unstable music scene it’s likely that this combination — despite being billed as “The Ivo Perelman Quartet” — is but a sporadic one. The session slightly predates that which resulted in The Alexander Suite, on which Perelman, Duval and Ulrich were joined by the other two members of Duval’s CT String Quartet. It’s easy to characterise Perelman as an old-fashioned free jazz screamer, a follower of Pharaoh Sanders and the like despite the fact that he evolved his own style in Brazil, independently of the US scene. He certainly has a lot of energy on this disc, and where sometimes that can be unfocussed, as it was rather on the ambitious Brazilian Watercolour from earlier this year, here he’s on the same confident, strong-toned form as he was on The Alexander Suite. That screaming, reach-for-the-skies stuff is only one thing he does, after all, and the fact that he’s a tenor player makes him easy to pigeonhole, unfairly, on the basis of that side of his personality. Presumably, those who think of Perelman as a hectoring, blues-based noise-maker are going to have a surprise when they hit the achingly beautiful “Santana”, with its melody which keeps on curling around in unexpected directions, or the lovely lines which appear halfway through “Rush Hour” and create great dynamic tension with the more forceful stuff elsewhere on that track. This writer has said before (probably several times) that Perelman’s use of melody is something quite unique on the current musical scene; well, here it sounds as good as it ever has on record, and that means very good indeed. The fact that the quartet members are all well-known to one another will come as no surprise to anyone who hears this session. Rosen and Duval are a regular rhythm section who have that close understanding which leads to the spouting of cliches about telepathy. No, it’s not telepathy; it’s shared musical methods and long-practised expertise at the game of free jazz with its waves of energy, its constant flow of ideas around the group and its palpable sense of attenuated concentration. Rosen has a crisp attack which is really welcome in this kind of music because it never muddies things (muddy free jazz can be a pretty awful experience) and Duval’s bass seems able to go anywhere and do anything. Ulrich is the wild card here, at least on paper. If he were a pianist, it would be a classic bebop quartet; if a trumpeter, a classic free jazz formation. But no, he’s a cellist. Surprisingly, it isn’t odd at all. Remember, Duval often plays with the bow, and he and Ulrich are able to construct an active, moving but not over-dense texture which a pianist would find far more difficult to achieve. That’s the chief virtue of this session, aside from the great playing all round: its lightness. Free jazz, especially the sort most often called “energy music”, is often hulking and loud. This group manage to make it float like a butterfly and sting like a bee, and the way they do it is by making sure everyone has the space to move around in what can sometimes be very hectic music.